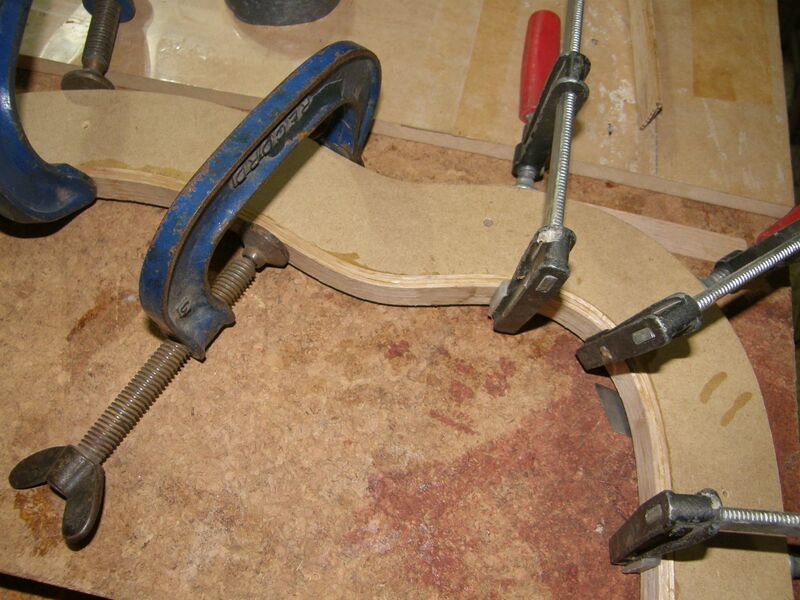 The top linings form the joint between the soundboard and the sides of the guitar. Generally guitar makers use kerfed linings like the one above. They’re easy to bend around the curves, and they act like a series of small reinforcing blocks to tie the top and sides together. They work well, and I use them for the back-to-side joint. I cut the strips on my table saw from a blank that I have thicknessed to 18mm in my drum sander. I then thickness the strips to 2mm in the other dimension (actually, I stay in this dimension to do it) by feeding the cut faces through the drum sander. Using good old Titebond glue, I laminate three 2mm thicknesses in a mould to end up with a pre-shaped lining of 18x6mm. To make it easier I prebend the strips using the side bender, otherwise they put up a hell of a fight. What I’m doing here is cutting notches to house the top of the side-splints that will reinforce the sides. The splints also add rigidity to the sides, and a bit of useful mass as well. 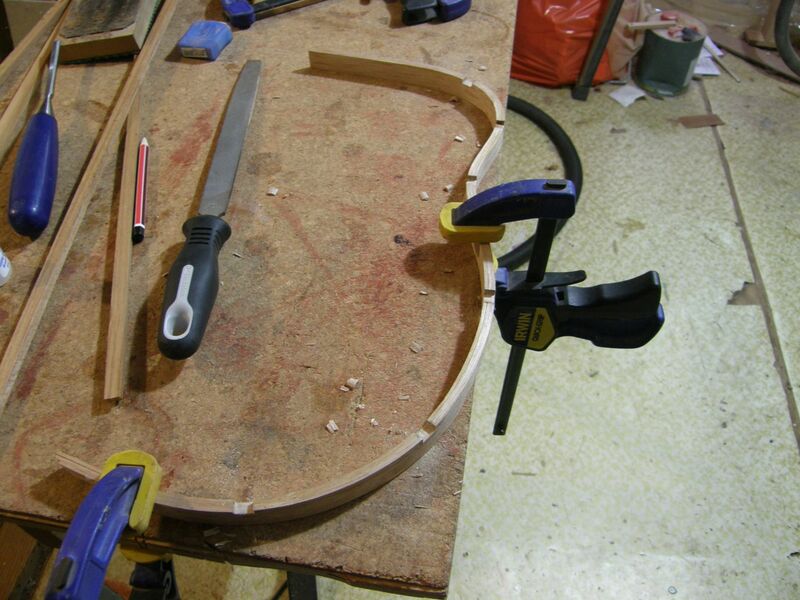 I then glue the linings onto the sides, after which I can saw the ends flush with the construction mould. 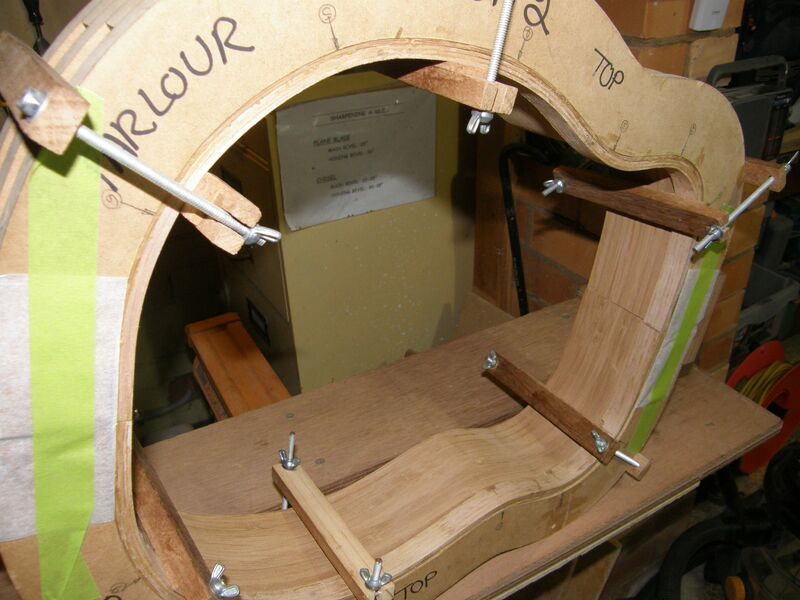 After that I bolt the two sides of the mould together ready to take the top and tail blocks that unite the sides. Notice the very clever placement of baking paper to avoid gluing the guitar to the mould. Yes, we guitar makers are a cunning lot. This entry was posted in Bamboo guitar, Guitar construction and tagged Australian Oak, bamboo, linings, Mountain Ash, side splints, Titebond glue on November 10, 2013 by Michael Williams.